A Star fell on me. 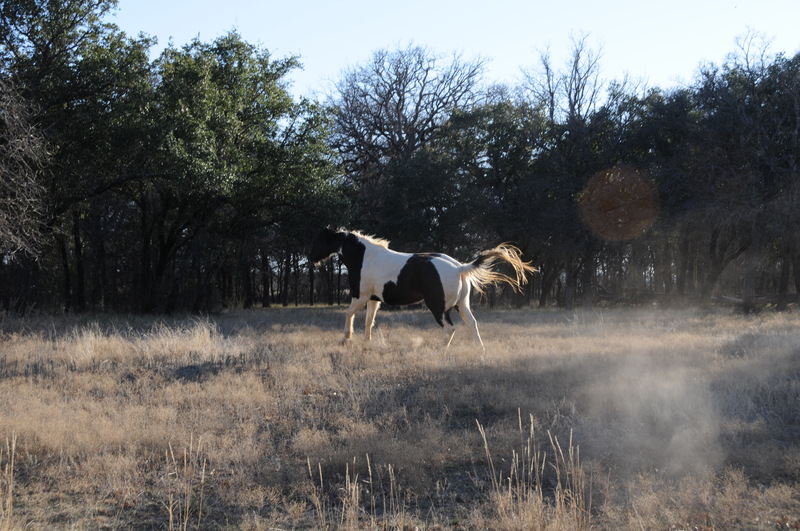 A September day in 2002, the paint horse named Star ran into my life. 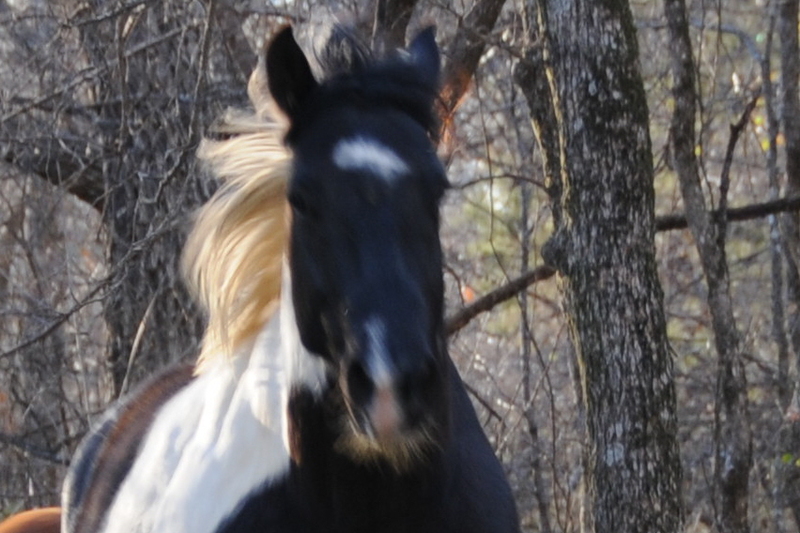 His mother, Lilly, accompanied him, but he pranced with an independent bounce and cocked his head towards me when I first saw him, a knowing look in his dark eyes that he was coming, full gallop, into my circle of kin. Did I like him, he asked? Oh, yes, I liked him and as our friendship endured, Star has become my companion of heart. Star is a big paint horse, standing sixteen-plus hands, weighing about 1,300 lbs. I describe him, jokingly, as the beer wagon horse. His full name is Star Bars Moore, each name carrying champions in his blood. He is gelded and the emasculation probably gentled him, but I sense that even if he had been kept intact, he would have been mostly mannerly towards his keepers and offspring. He baby-sits. He watched two foals (Fanny and Shiney) grow into yearlings and kept them safe and out of harm. Star would stay with the foals in the pasture and the brushy creek areas, keeping them company on the first weeks of their weaning. The foals grew and challenged him. Star never fought them, but would walk away from their threats, knowing the antics of growing teenagers. I sensed a sadness in Star that his charges went against him when he had protected them. Star is quiet. It’s natural to be so. I stood in the corral one winter day, looking at horses in the field, when Star walked up quietly behind me and put his head on my shoulder, peering in the same direction. His heavy head fell so lightly on my shoulder it was like the embrace of a friend. We stood there, as young boys often do, chatting about this, about that. I talk to him: Good horse, strong horse, courageous horse. I move away after awhile and he follows me to the gate and when I look back, Star has put his head over the gate and looks at me get in the pickup and drive up the hill to the house. I know in truth that a star is in my barn. This is Yucca Meditation. Why yucca? It’s an abundant succulent on our place here in west Texas and every time I look out from our porch to the southern skies and mesas, I see yuccas. Yuccas here, yuccas there, yucca yucca everywhere. I like yucca. Surrounded by a lot of yucca, I think about many things. Nothing more, nothing less. I have written a post on the pond at West Cut on Baird Hill, along Interstate 20, near Abilene, Texas. The pond in the last two years has gone from a vibrant, lush pond of cattails and flora to a grayish-brown receptacle of run-off from nearby inclines. Though my proof is impressionable and subject to further research, the most likely cause of the pond’s decline is water run-off from construction of power lines above the pond that transfer power from wind farms on the east and north side of Abilene. I saw the construction crews and they did not run willy-nilly all over the ranch land. From what I saw, crews behaved as stewards to the land. These days, wind farm blades turn and electricity emerges from a green source, renewable and free by all accounts. Even so, because of transmission lines, a pond declined in health, an impact unintended and unforeseeable. This brings me to the cats. After World War II, the World Health Organization (WHO) and other similar agencies sought to eradicate the mosquito that carried the plasmodium of malaria. DDT was the first insecticide applied in regions that had a high incidence of malaria. In Borneo live the Dayak people, residing in large single homes or long houses of up to 500 people. After the application of DDT to the mosquito population, malaria was eradicated and the overall quality of life and energy of the tribe dramatically increased. The tribe’s health had never been so good (1). Living in the long houses, however, were cockroaches, cats and small lizards — the gecko. The cockroaches ingested the DDT and the geckos ate the cockroaches. Normal pattern. Cats ate the lizards, but the lizards had become lethal weapons through the eating of so many cockroaches laced with DDT. The cats, unfortunately, all died from eating the lizards. Not normal. The unintended consequences of helping the Dayak people eradicate malaria did not stop there. When the cats died, rats from the surrounding woods invaded the villages, bringing the sylvatic plague through fleas, lice and parasites rats normally vectored. The Dayak missed their cats greatly. The Royal Air Force (RAF) and the WHO met the situation in quick order. The RAF parachuted 14,000 living cats into the villages to eat the rats. I can see it now: parachutes with kitty-cats in crates dropping from the skies. I don’t think they would have harnessed the kitties with little webbings and ripcords, do you? In the roofs of the thatched houses lived a small caterpillar that burrowed into the rafters and before the DDT spraying, caused little damage. Parasites and predators of the little caterpillar had kept the caterpillar population in check, particularly the wasp. The DDT killed the parasites of the caterpillar, the caterpillar population skyrocketed, burrowing deeper into the rafters of the long houses and single homes, resulting in the collapse of the huts and exposure of the population to the elements before repairs. The Dayak must of thought the end of the world was near, seeing cats drop out of the sky and houses collapsing. Oh, the evil WHO! DDT has now been discredited and is not used widely, if at all. The initial application of the chemical was intended for good effect and that was attained, yet the unintended consequences were disastrous for the Dayak, and, we know today, bad for many organisms in the food chain. The correlation of DDT and the effects of wind farm construction occurs only at the juncture of unintended consequences. DDT has been completely taken out of most systemic plans for public health. Wind farms will remain and should remain. The West Cut Pond on Baird Hill will probably renew itself and ducks will arrive in October and not leave until March. In comparing the degree of damage by DDT and transmission line construction, there’s no balancing of the equation. Wind farms should stay. DDT needs to be tightly regulated. In the beginning, the application of new technology usually promises much: efficiency, improvement of health and speed (automobile vs. horse and buggy). 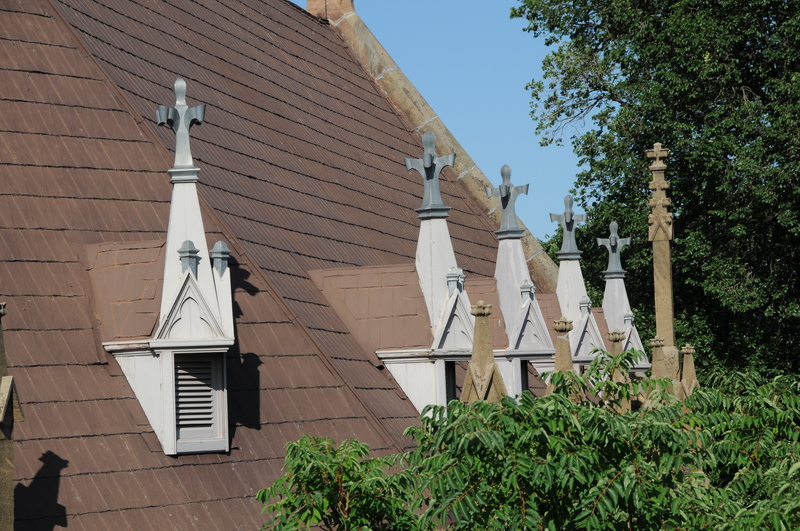 The continuing use of technology, however, reveals unintended consequences that may be destructive in a large sense (collapse of long houses) or small. The decision arises as to whether to keep the technology, drop it entirely or regulate its use. In my yucca frame of mind, let’s keep parachuting cats to a minimum and be careful, very careful, about the destruction of water habitats. 1. See Harrison, Tom, 1965, “Operation Cat Drop,” Animals, 5:512-13 as quoted and utilized in the article, C. S. Holling and M. A. Goldberg, “Ecology and Planning,” pp. 78-93, in an anthology by Daniel G. Bates and Susan H. Lees (eds. ), Contemporary Anthropology: An Anthology, New York: Alfred A. Knopf, 1981. 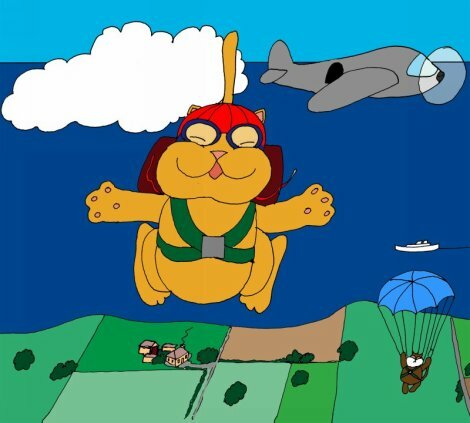 A blog post similarly composed is Planninga from Nanninga that has a parachuting cat cartoon and commentary on unintended consequences. See also “Parachuting Cats — A True Story.” The cartoon illustration in the post is from this article. Malaria cases in the U. S. are minimal (1,200 cases a year), due to the previous use of DDT. Malaria, however, appears in central Mexico today and is gradually coming northward to the U. S. The application of some form of insecticide in the coming decades will be needed to eradicate the vector mosquito. Lightening Strikes Castle and Sage to Meadow Repeater! A lightening storm moved through our area — west Texas — last evening and a lightening bolt struck one of the two repeaters for microwave service. The Castle on top of New York Hill at Mingus, Texas, was hit hard, but no fire or damage. Bolts of Zeus struck the Castle’s IP relay station, and I have just now been able to get back on the internet. Feisty fellow. I will reply to comments and post more these evening. I was not able to see the responses to Lyric and Teddy Bear until a few minutes ago. I have work to do in the field until after dark. Pardon the mythological reference. Who threw the lightening bolts? May have been Thor? I wrote Zeus. In the 1940s, in Brownwood, Texas, three movie palaces illuminated downtown: the Bowie, Lyric and Queen. I sat in all of them and learned much about Hollywood life, even Mexico because the Queen ran some of the best desperado celluloids I have ever seen. The Bowie theater showed upscale film, hardly any Saturday morning trailers for boys and girls. The Lyric posted both upscale (MGM, Colombia, 20th Century Fox) as well as the Lone Ranger, Roy Rogers, Tarzan and the Three Stooges. I can still see the darkened theater and kids at the Lyric waving and shouting and screaming and laughing, hands and arms waving between me and the screen. When I saw Purple Rose of Cairo, I saw myself in the audience at the Lyric theater watching the film come right off the screen and into my heart. Mother took me to the Lyric one day and I took my teddy bear, young boy that I was. I fell asleep. After the showing, we came back to the trailer house on Austin Avenue, where the clocks spun in the dirt. The trailer was cramped for the three of us: mom, grandmother and me. Sweltering in the summer, pumping and pushing those sprayers of mosquito repellent at night. I looked for my bear at bedtime. The bear was gone. I had dropped teddy when I fell asleep and now it was gone and in the hands of who-knows-who at the Lyric theater. A day went by and I missed that bear. I uplifted the pillow and there was my teddy bear, black buttons for eyes and leather for its paws, all back in my clutches, never to leave my side again. What vacuum had been was now evaporated in the retrieval my mother obtained from the Lyric theater management. She had gone next door to use the landlady’s telephone to have them hold the bear until she could walk (we had no car) back downtown the next day, rescue the bear and come back to our trailer house on Austin Avenue. The good citizens of Brownwood have turned the old theater — it has been shut for decades — into a thespian venue, replete with new furnishings and grand opening. A new palace for acting and art. I can extrapolate, but won’t right now. It’s good, not bad. I parse the loss of the bear and its return. What I see and feel is a mother caring, a business attentive to lost toys and a town that nurtured its community with innocent amusement for a post-war generation. The Lyric theater in 1914, from what I read about it, was to be a theater for live performance, probably a late-vaudeville medium as well. If that is true, then the Lyric theater has gone from a venue for live performance to Hollywood and serials on Saturday back again to live performance. A cycle. When I lived in that small town, I never lost anything, not even a bear at the Lyric. 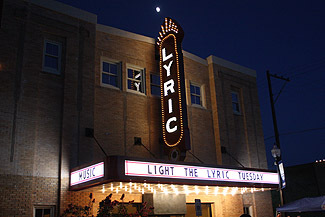 For a link to the changing venue of the Lyric, click on: Lyric Lights Up Downtown Brownwood – Photos & Video. “Saddle us, now,” I thought I heard. 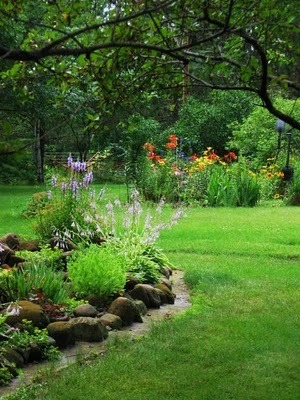 Teresa Evangeline’s Garden and blog. Three terraces form the foundation for our home on a hill. The hill stands out in the Turkey Creek Quadrangle map, but it has no name. We refer to our knoll with its expansive view in west Texas as Poprock Hill, but the numerous swallows gliding about our home prompt us to rename the hill: Swallow Hill. We’ve not committed to the change, but the possibility lingers. Pale-leaf Yucca grows and roots along and down each of our three terraces, providing nectar for moths and fruit for deer although we have seen no deer in several months. The yucca stalks are several feet high, the blossoms are so heavy that most of the stalks are weighted down, drooping bulbs, yet still a vibrant yellow-white for weeks in mid-spring. By now, the last days of July, all of the blossoms have fallen. It is said that plants grow in assemblies, like a family of sorts. If so, then our yucca family on Poprock Hill prospers and grows haply. I do not see the yucca as a plant to be uprooted, but as a succulent that prevents erosion of our terraces, an ornamental of natural spikes guarding our home. A protector. Someday because of erosion we will have to reinforce the terraces, but we will not uproot one yucca, one family, one blade, to do so. Bayonets, stakes on the plains, these yuccas have been named in history. For us, however, our Pale-leaf Yucca are our cousins that enliven the daily family reunion we have with nature. Opening up the senses in the country — it could also be the city — means to go outside, into the weather, the air. Lewis and Clark saw antelope rub their heads on sagebrush to perfume themselves. 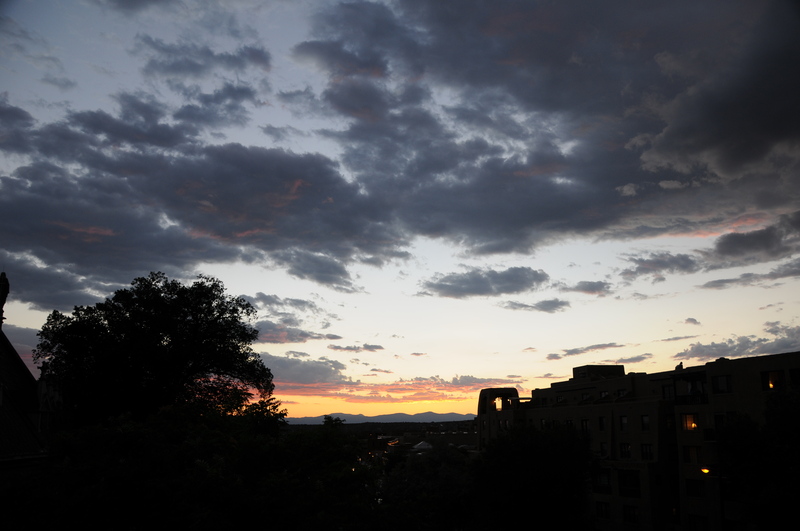 I camped one night on the Zuni reservation and a light rain fell that exploded the smell of sage around me. Today the dominant scent is dust, stirred by shredding broomweed that has a pungent, woody quality when cut. From time to time, however, the broomweed receded as I shredded wild thyme, rising up in sweet waves to greet me, please me, offering a odor that buffered dust and wood. In the distance, I see thunderclouds and rain shafts, and coming on the cool breeze is the smell of rain sprinkling the ground, turning dust to loam, a nursery for wild thyme. Dominant not is dust anymore. A revolution of the senses always comes with rain. petrichor — a pleasant, distinctive smell frequently accompanying the first rain after a long period of warm, dry weather in certain regions. Also, an oily liquid mixture of organic compounds which collects in the ground and is believed to be responsible for this smell (Oxford English Dictionary). Our ranchito is faraway from the nation’s land line-broadband backbone. The fiber-optic cable stopped at the Barton Creek Water Cooperative pumping station about three miles to the south of us and the Interstate-20 nexus is four miles away. We have no fiber-optic cable, but rely upon another technology. Flying Hat Ranchito, our 53 acre, low-impact horse and cattle operation, connects with a high-speed, microwave service providing fast — 2 megs. per second variable — speeds through a Fort Worth, Texas, service, Mesh.net. The relay from our house goes to the Rust Ranch horse arena, about four miles away, then from Rust Ranch to the Celebrity Ranch Castle above New York Hill near the ghost town, Thurber, Texas. From the Celebrity Ranch microwave connection, the backbone is tapped along Interstate-20, about one-half mile away. In short, we are three microwave towers away from a fiber-optic connection (our tower, Rust Ranch, Celebrity Ranch, then the cable). 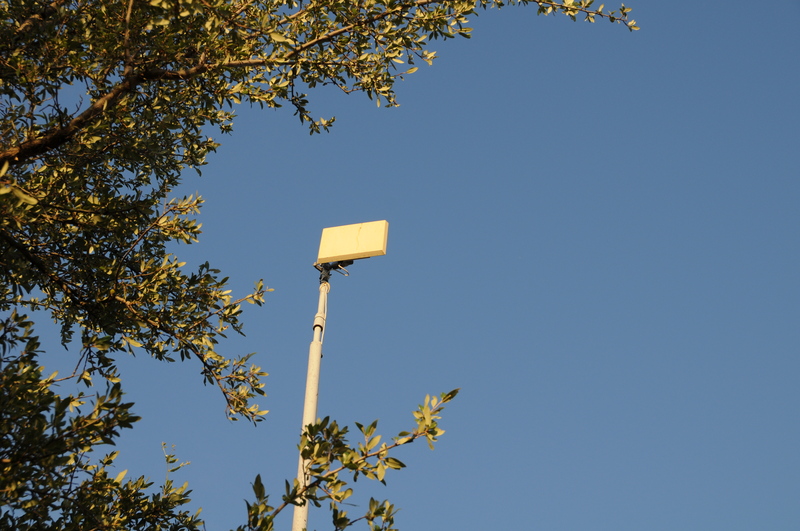 This connection through microwave relays costs $117.00 a month. Installation was $750. 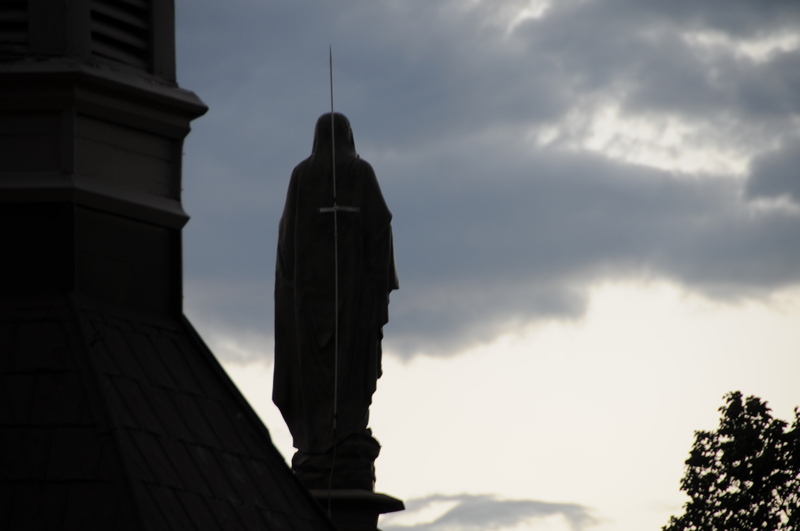 I teach four online history classes and maintain a blog, Sage to Meadow. I have grown dependent on the internet for income, news and e-mail. I read The New York Times and Washington Post each morning before I feed the horses and go to work — twice a week — in Abilene, Texas. My dependency on the internet has steadily increased since 1989, when I first began to learn the technology of main frames and word processing on computers. All of that being said, I don’t want broadband and I don’t want the associations that go along with the internet: online classes, blogging, facebook, twitter, e-mail and on-and-on. But, I use them all. The internet has constricted, even eliminated, face-to-face classes. I no longer see, smell, touch or enjoy the organic unit, the human body as I once did. Conversations around the student union or commons are limited and many of my friends I no longer see, but maintain contact via electrons. Things have gone so virtual that I have become organically starved for human contact. I cannot pick up on my students’ immediate, organic reactions, nor they on mine. Don’t bring anymore internet to the country. In fact, reverse it. Develop human contact, real human contact by handshakes, face-to-face communications. See your friends in “real” reality, not “virtual.” It is far better to go to Huckabay General Store and sit around the coffee table and get the news of north Erath County than it is to read news online. I see my neighbors and they see me. We can give tips of craft on farming, taking care of livestock and they can notice an oil leak from my pickup and suggest a remedy. You can’t do that on the internet. Internet providers for rural areas will destroy the diversity and local color of communities. Send teachers to rural areas, re-create independent school districts and recruit on-site professors, if you are concerned about education. I don’t need broadband. I don’t want it, but I have to have it. For now. For a broad spectrum of positions on rural broadband, see Stimulus Stirs Debate Over Rural Broadband Access : NPR. See also the Center for Rural Strategies that has several articles and policy statements. Use of the internet for “texting” confronts parents at dinner tables, professors with classes. Last year I caved in and let my students put their cell phones on their desk, but limited their texting — moderate their use to one or two messages a class. I had students hiding their cell phones in their laps, under their coats when I had a strict prohibition. The internet is used as a form of communication. It is a medium like a rock wall upon which a paleolithic person chisels, buckskin and red ocher for the Sioux, paper and pen for correspondence. You may also factor in ham radio (I have a General Class license — N5LWM) that has absorbed men and women for generations by the use of telegraph and voice. These mediums or modes take persons away from face-to-face communication. In all of these mediums, you cannot extend your hand and shake the hand of another. Or caress. Substitutions are substitutions are substitutions — virtual reality. A profound loss with profound consequences. See also Jacques Ellul, The Technocratic Society. 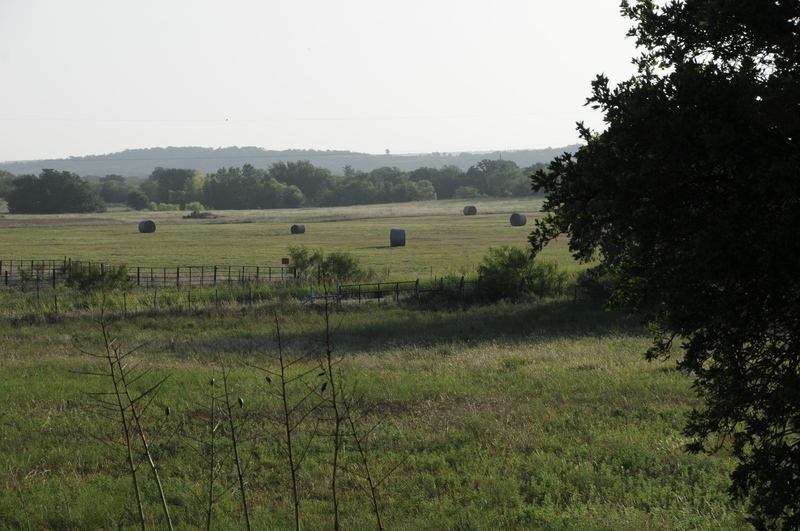 Grass remains high and relatively green in north Erath County, Texas. Broomweed shredding seems in order today. Must plan for a quick construction of stock pen in Pecan Tree Pasture to manage horses so that they do not overeat the grass. Horses have not been feeding in the far pasture anytime this summer. The Persian barn cat, Bubbles, has disappeared. I have not seen him for two weeks. My small animal vet says that owls are significant predators on cats and small dogs. Bubbles was quite close to the barn. Perhaps he will reappear. 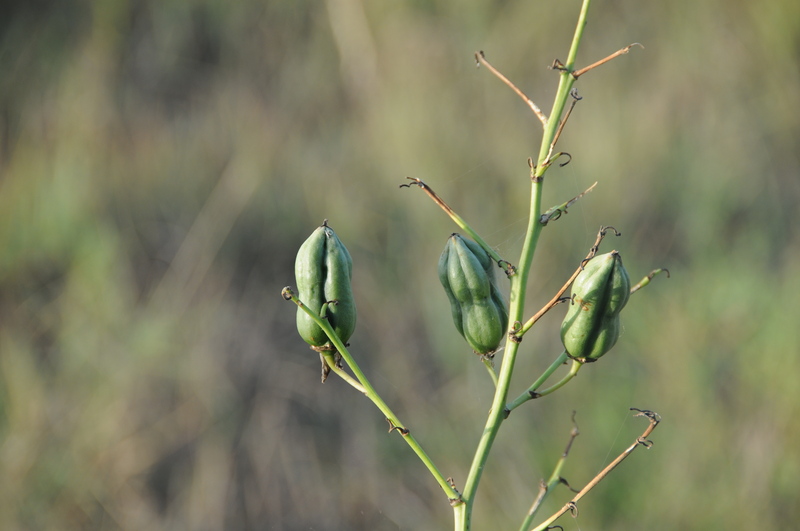 Some yucca pods appear to be re-greening. Nowack, to the north of us, across County Road 114, hired a farmer to bale the prairie grass in his south field. 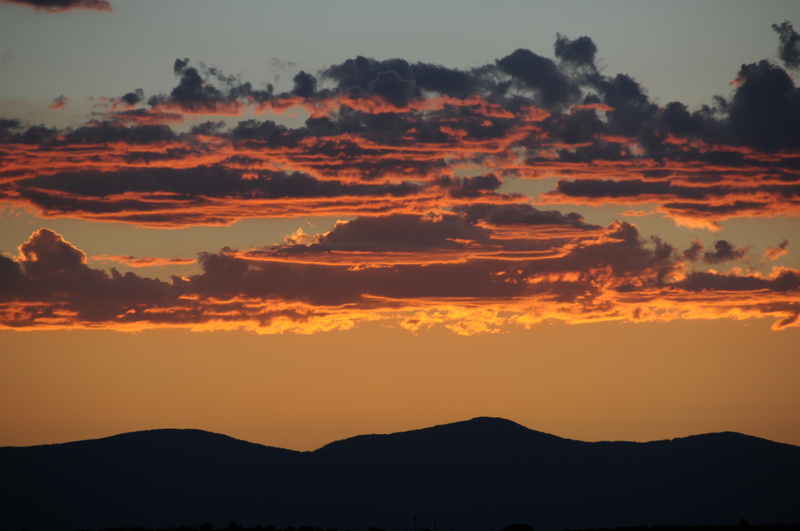 Over the past week, my wife and I have encamped near the Pecos Wilderness in the Carson National Forest of northern New Mexico, traveled the High Road of Taos down to Santa Fe and rented a pleasant room at the Inn at Loretto. Observations noted during field work and retrenchment in the The City Different Santa Fe are listed below, impressionable and subject to interpretive change with further research as well as some drying out and recuperation. 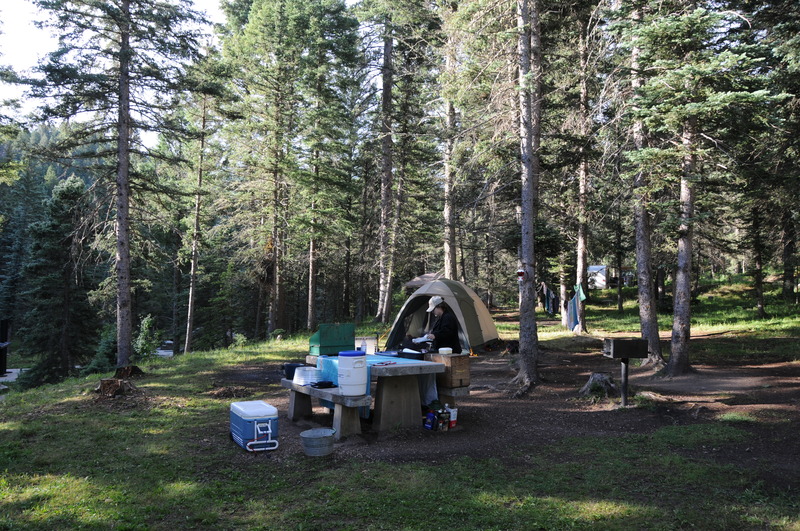 Santa Barbara campground, in fact all of the Carson National Forest campground facilities, has been contracted out to a private concessionary firm, Scenic Canyons Recreational Services, Inc. A resident couple permanently camp at the entry point. Vegetation on the trail from Santa Barbara to Pecos Wilderness seems healthy and more intense than I remember in 1968. The Chimayo Restaurant serves a spicy carne adovada, whose effect remains for hours (1). The Trujillos of Chimayo gave us wood for three fires when they broke camp. Mr. Trujillo has an apple orchard and a V-10 F-250. Mr. and Mrs. Trujillo had camped beside us. A fisherman from Rodarte, New Mexico, scanned the debris area of the space shuttle Challenger for several weeks. They formed lines of 1,000 scouts, side-by-side and touching. When debris was found, the whole line stopped while it was harvested. He had been a U. S. Forest Service employee at the time of the disaster. Considerable road improvements are being made on the High Road to Taos, straightening out curves. The diamond hitch for roping cargo in our pickup works extremely well. We ate at Doc Martin’s, Osteria, La Fonda, Luminaria, Casa Sena and 315. Don Rael’s margarita at the La Fonda bar is one good concoction and we met Rael who created the drink. At the bar, I met a young lady who works at the Santa Fe Opera and who once lived in Hurst, Texas. Santa Fe Pale Ale now puts out a wheat beer. Brenda gave me a birthday present: a sage-cornmeal-sea salt exfoliation and massage at the spa at the Inn at Loretto. I am not given to such follies, but Brenda was insistent. I have visited in the early 1970s the springs at Jemez after extended field work in the Gila. The spa treatment was a little different. Amelia was my therapist whose family is from East Prussia. 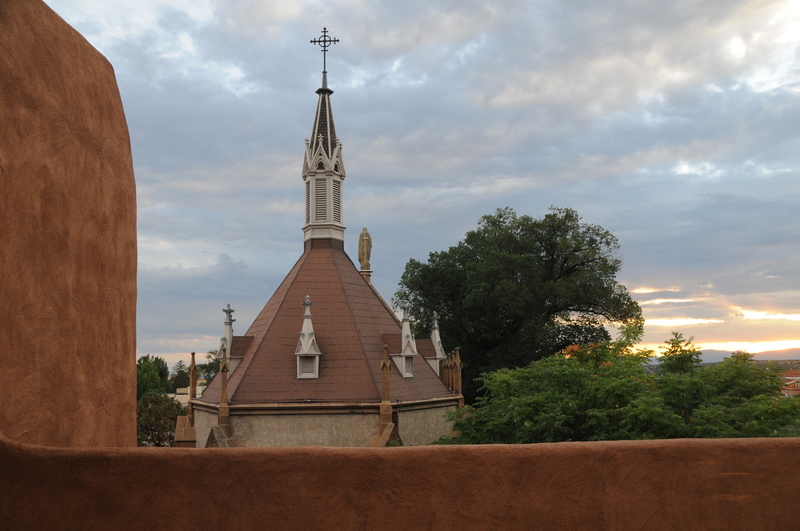 The Ernest Thompson Seton exhibit at the New Mexico Historical Museum is sad, inspiring and elevating. President Teddy Roosevelt was wrong to have set Seton aside in developing the outdoor movement. The Boy Scouts of America did award him, however, the Silver Beaver Award. On the plaza, I hear more variety of music from several directions, sometimes at once, reminding me of something old and ancient. I hear dobro, banjo, guitar, mariachi instruments, harmonica, vocals. This is an increase of variety from years past. Locals are now coming back downtown in greater numbers to hear local bands and itinerant musicians. The plaza is a family affair, all ages, reminiscent of older times. 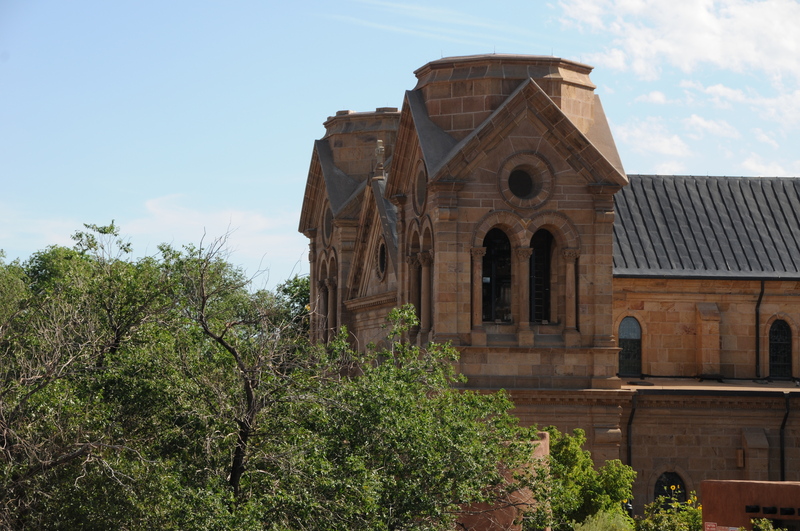 On Saturday, the bells of the cathedral of Saint Francis rang for two weddings in addition to regular tolling at 00:15, 00:30, 00:45 and the beginning of the hour. At one of the wedding parties following the ceremonies, through terrace doors, we saw Mother and Son dancing together in celebration of the marriage to his lovely bride. 1. Presently, diacritical markings are omitted for Anglicized spelling because of expediency. Plaza walking in the late afternoon and early evening incites the senses. There are food carts about the plaza, hanging baskets of flowers from the lamp poles, music and young children and grand parents playing. A few couples are dancing when appropriate. Some apparently homeless individuals are passing their time. A number of people are lounging on the plaza grass. I counted about 200-300 people about the plaza on an early Saturday evening. People greet and meet, come and depart, lightened.